You will have to search hard to find advice better than this. I think you can apply this to just about anything in your life. That's one more reason to like Mike Rowe. He's too cool! If you enjoyed Mike's advice, share it with others. 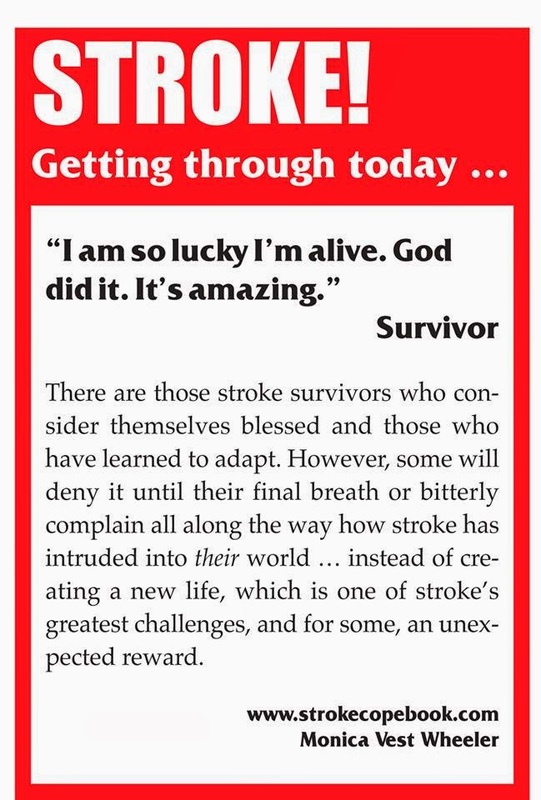 Following is an article submitted by Lucy Lazarony on StrokeSmart.org, March 13, 2014. Lucy interviewed Kyle and Lindsey Wilhelm who are music therapists at many of our Retreat & Refresh Stroke Camps. Kyle and Lindsey live in Iowa but attend many of our camps throughout the U.S.. They also travel to our national offices in Peoria, Illinois to help with planning the years camp themes and agendas. We spoke with Kyle and Lindsey Wilhelm about their innovative techniques of helping stroke survivors regain their speech and movement. Music therapists often work in collaboration with speech-language pathologists to address speech and language skills with stroke survivors. Survivors who suffer from aphasia may have difficulty speaking, but during therapy discover that they can sing an entire song fluently. This is because the part of the brain affected by the stroke that controls expressive language (known as Broca’s area) is localized in one area of the brain while music production (singing and playing instruments) and processing (receptive listening) activates multiple areas of the brain. By using music, the therapist can work on skills using the non-damaged areas of the brain to help the survivor relearn how to do what the damaged area of the brain used to do. How does music therapy help stroke survivors with their physical therapy? Music therapists also collaborate with physical therapists to help survivors regain functioning of both their upper and lower extremities as well as fine and gross motor skills. For example, the music therapy technique Rhythmic Auditory Stimulation (RAS) uses a steady, rhythmic pulse to help the survivor with their gait (walking). 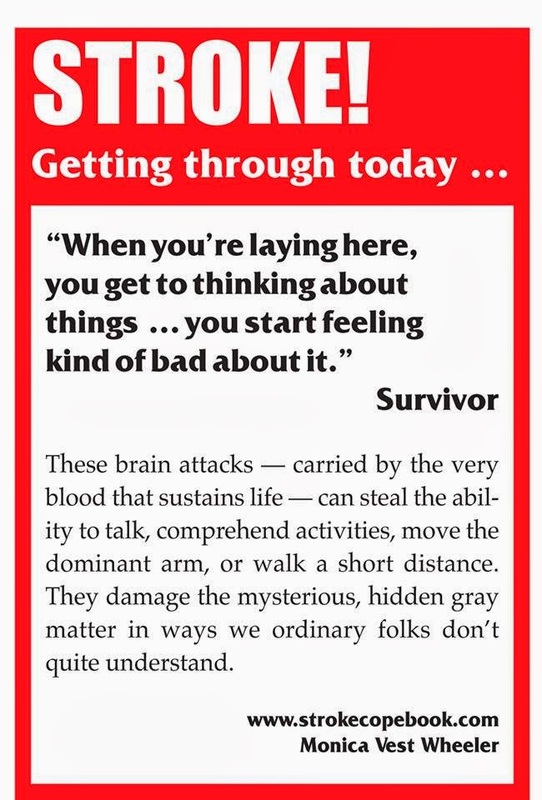 The survivor will naturally match the strong rhythmic pulse providing the temporal support to regulate individual steps and motivation to keep going. How often should a stroke survivor meet with a music therapist? 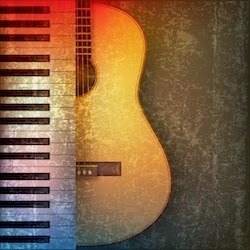 The key to learning or relearning any skill is repetition. A typical frequency is 1-2 times per week, but additional therapy will likely improve physical and motor skills. The music therapist can show the survivor ways to incorporate music into exercises prescribed by other therapists at home. By making the exercises more enjoyable, the survivor will be more likely to do them regularly, which can positively affect rehabilitation overall. How to find a music therapist in your local area. 1) Visit the American Music Therapy Association online directory. 2) Ask your speech therapist for a recommendation. Like this article? 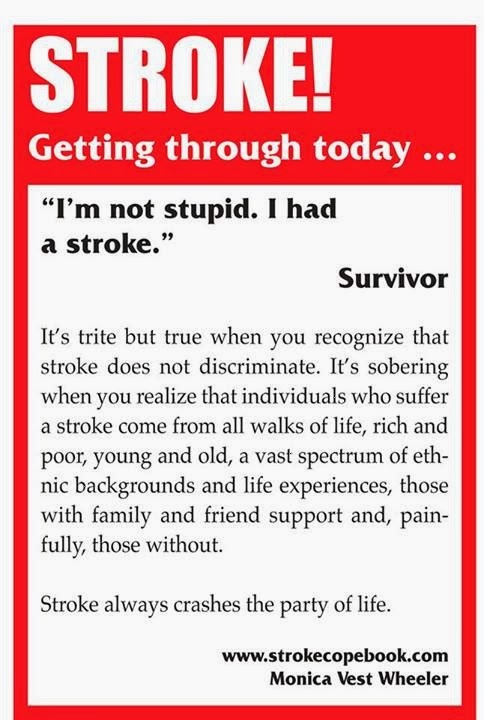 Donate now to keep StrokeSmart free to anyone that needs it. 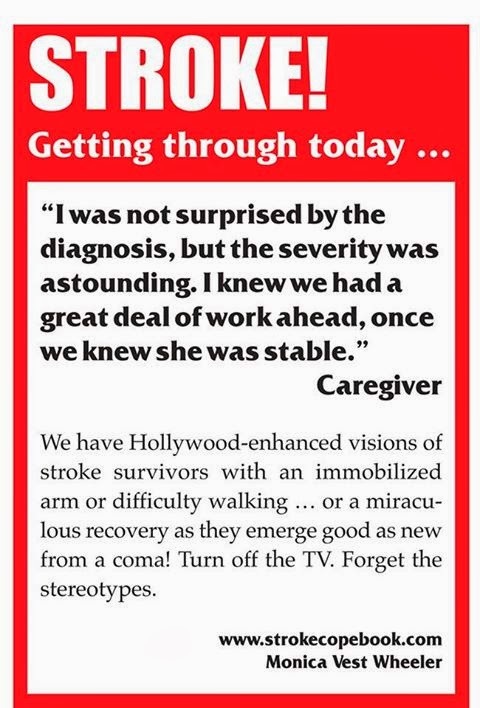 StrokeSmart is not affiliated with Retreat & Refresh Stroke Camp. 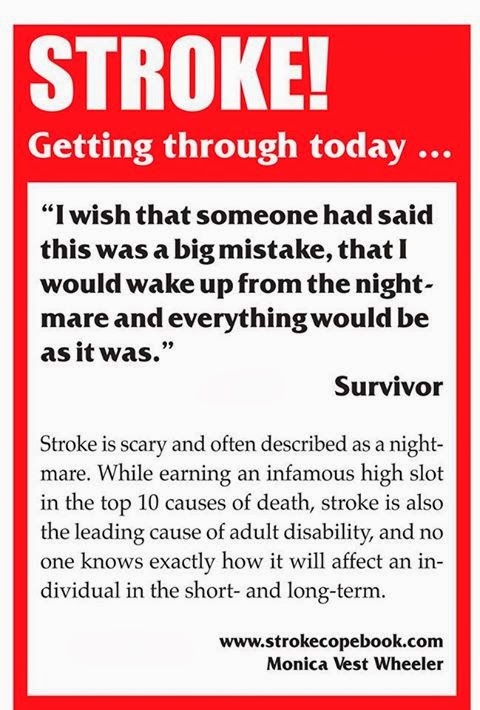 Any donations will go directly to StrokeSmart and not to Retreat & Refresh Stroke Camp. 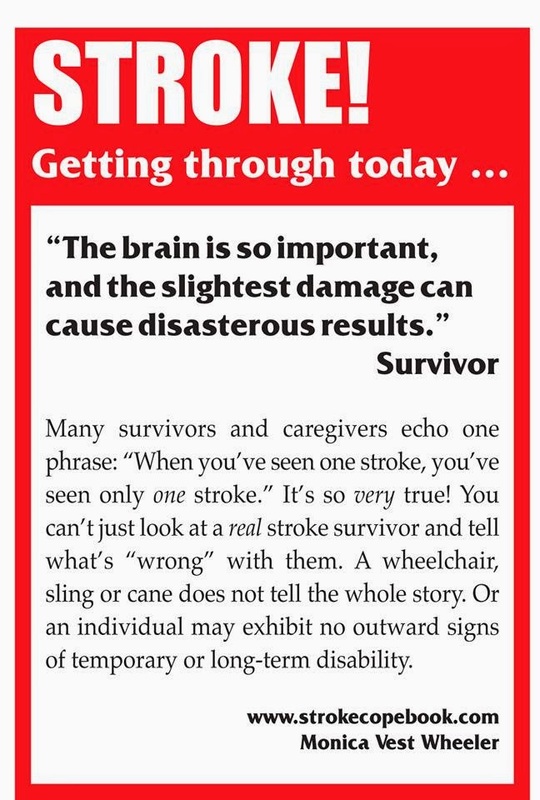 If you would like to visit the StrokeSmart web site go here: http://www.strokesmart.org There are many excellent articles there pertaining to strokes. Everyone should know who Monica Vest Wheeler and her husband, Roger, are by now. She has contributed many articles for this blog over the years. 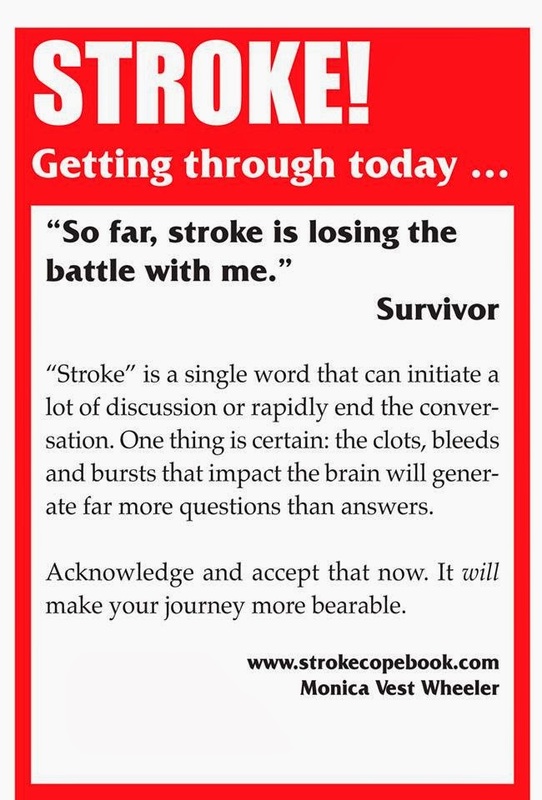 Monica has published some excellent books on strokes, Alzheimer's and other brain injuries. I have posted three articles of hers so far this month. Here is her website where you can see her work and even obtain copies for yourself or for your friends and neighbors. She has been delighting us on Facebook with some of her unique and thought provoking posters for the past few weeks and I thought I'd share a few of them with you this week, especially with those of you who are not seeing them on FB. I have included seven of them here. I think she is going to do something really cool with these in the near future. If so, remember, you heard it here first. Your blood pressure varies throughout your day depending on what you are doing. The more active you are the harder your blood has to be pumped and this then causes the blood pressure to rise. exercises consistently, it will help to lower highbood pressure. However, if the pressure rises too high and/or does not return to normal, there may be a problem. Let's look at why blood pressure increases during exercise and know if it's normal. When you are exercising your muscles need more oxygen. The heart then pumps more blood around your body with more powerful contractions which will make your blood pressure increase. Your systolic blood pressure increases during exercise as the cardiovascular system delivers more blood to the working muscles and your diastolic blood pressure stays roughly the same or decrease slightly. The normal blood pressure varies for many different reasons, such as age, amount of physical activity, profession etc. As you learned in last week's article, the average is 120/80. That is, 120 for systolic and 80 for diastolic. But it can range anywhere from 90/60 to 130/80. If your blood pressure is above 140/90 while you are resting, it is a cue for hypertension. Then, you better be seeing a doctor. In most cases, the diastolic rate changes vary little if any while you exercise. If there is an increase though of more than 20, or if the diastolic rate becomes 100 or more, you should discontinue exercise right away. If you have high blood cholesterol levels, which is known as hypercholesterolemia, or coronary artery disease your diastolic rate can increase significantly while you are exercising. If you do have any of these conditions, I would hope you would be working with a doctor by now. It is imperative to note that hypertension not only requires more energy for the heart to be able to pump the blood, but it can also lead to congestive heart failure as well. So what about that higher number, the systolic? A normal range for a systolic rate during exercise is between 160 and 220; if you are overweight the rise in blood pressure is somewhat higher. If you fall into the normal range at rest but your pressure reaches 190 after exercising, this is a good cue that you will suffer from high blood pressure in the future. Weight lifters have significantly higher systolic rates. The reason for this is, while they lift weights, there is a reduction in the amount of oxygen, because their muscles constrict. This requires the muscles and organs to get more oxygen rich blood. Do keep in mind, any and all overexertion can lead to heart attacks or strokes, so it is important not to overdo it. So, why can exercise help? Regular exercise can help to lower your blood pressure, as long as you keep it up. That’s because exercises make the heart stronger so that it can pump more blood with less effort. By maintaining exercising and being more active you can lower your systolic rate. As we all know exercise is good for all of us for so many reasons and this is just another great reason to exercise regularly and not to stop, because if you discontinue the regular exercising, the blood pressure will jump right back up. It does take about 3 months initially for the exercise to begin to lower your blood pressure. It is recommended that you exercise either 2½ hours of moderate exercise or 1 hour and 15 minutes of vigorous exercise a week, or even a combination of the two. Moderate exercises, which can be any aerobic exercise that increases both your heart and breathing rates, include exercises, such as swimming, bicycling, jogging, walking (speed, or power), etc. Household chores, such a scrubbing, mopping, mowing, raking etc. are also included in the moderate exercise category. So, why not do 30 minutes once a day only five days a week or 20-25 minutes seven days a week? If you think about it, it does not really take all that much extra work, and you can achieve it by just pumping up the regular way you do things, like walking or cleaning. If necessary you can even do a few quick bursts a day, they count too. Now you know there is always a warning and you've read some already in this article. It is always necessary to consult a physician before beginning any exercise routine to treat hypertension. There are concerns that a doctor must discuss with you and also they can help you to design the proper workout for you. If you have any underlying factors, such as high cholesterol and diabetes, there are major concerns, such as developing hypertension, so again it is necessary to consult your physician to be safe, rather than sorry. Extra care should also be taken about exercise when you are having high blood pressure.